Learn more about the 2016 Ford Fusion in this expert review from Edmunds.com. For 2016, the Ford Fusion sees no notable changes other than the debut of a sporty “Appearance package” option for the S trim level. When it was completely redesigned three years ago, the Ford Fusion sprinted from the middle of the pack to front-runner status in the super competitive midsize sedan segment. As a testament to just how right Ford got this car, there have been only minor changes since then, yet the 2016 Ford Fusion remains one of our top picks. Strengths include handsome styling, refined ride and handling characteristics, a quiet cabin and a peppy yet fuel-efficient engine lineup. 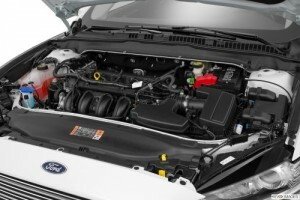 Two of the Fusion’s available engines are turbocharged. Go with the 1.5-liter four-cylinder engine for maximum fuel economy or the 2.0-liter for robust acceleration. All-wheel drive is also available, which is a rarity for this class of car. There are also enough high-tech luxury and safety features to please a lifetime subscriber to Wired magazine. The Fusion can be had with everything from adaptive cruise control to automatic parallel parking. 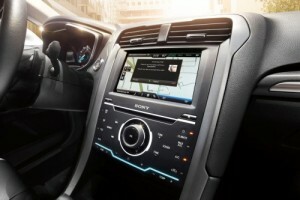 There’s also theMyFord Touch electronics interface, which governs various audio, climate, navigation and phone tasks. While it’s occasionally tricky to use, it offers useful customization options and voice control functionality. Still, Ford isn’t the only automaker that knows how to build a midsize sedan that combines stylish design, high-tech features and strong fuel economy. Efficiency has long been a leading attribute for the Honda Accord, a brilliantly executed sedan in almost every sense, even if it’s not quite as handsome as the Fusion. Hyundai’s recently redesigned and well-regarded Sonata presents a great value. The well-rounded Nissan Altima and popular Toyota Camry are other midsize sedan favorites. Overall, though, the 2016 Ford Fusion is right there at the top with its abundance of practicality, technology and style. 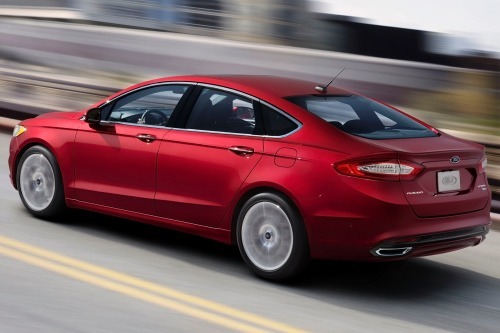 The 2016 Ford Fusion is a four-door, five-passenger midsize sedan available in three trim levels: S, SE and Titanium. There are also hybrid and plug-in hybrid (known as the Fusion Energi) versions, which are covered in separate reviews. The Fusion S comes standard with the 2.5-liter four-cylinder engine, 16-inch steel wheels, automatic headlights, full power accessories, a rearview camera, cruise control, air-conditioning, a tilt-and-telescoping steering wheel, a height-adjustable driver seat, 60/40-split folding rear seats, audio and phone voice commands (Sync), Bluetooth phone and audio connectivity, smartphone app integration and a four-speaker sound system with a CD player, auxiliary audio jack and a USB port/iPod interface. Optional for the S is the Appearance package, which features 18-inch alloy wheels, foglights, color-keyed lower side sills and a rear spoiler. Moving up to the Fusion SE gets you 17-inch alloy wheels, exterior keypad entry, heated mirrors, an eight-way power driver seat (with power lumbar), a six-way power passenger seat, rear air ducts, a rear center fold-down armrest and a six-speaker sound system with satellite radio. The SE is also eligible for additional optional equipment. As with the S, an Appearance package (Equipment Group 201A) is available that adds 18-inch alloy wheels, a rear spoiler, foglights, a leather-wrapped steering wheel and special cloth upholstery. The Luxury package (Equipment Group 202A) adds an auto-dimming rearview mirror and driver-side mirror, leather upholstery, driver memory settings and heated front seats. Opting for the SE’s MyFord Touch Technology package equips the Fusion with rear parking sensors, dual-zone automatic climate control, the MyFord Touch electronics interface (with 8-inch central LCD touchscreen and two configurable gauge cluster displays), an upgraded version of Sync, two USB ports, an SD card reader and an RCA video input jack. 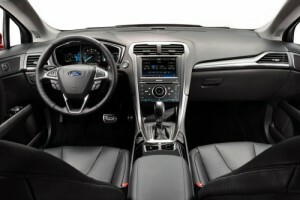 The Fusion Titanium comes standard with the turbocharged 2.0-liter engine, 18-inch wheels, a sport-tuned suspension, keyless ignition and entry, remote start, sport front seats, eight-way power adjustment for the passenger seat, a premium 12-speaker Sony sound system, HD radio and all of the SE’s optional features mentioned above. The Fusion SE (with the Technology package selected) and Titanium can also be equipped with a navigation system, an automated parallel-parking system, a heated steering wheel and adaptive cruise control with frontal collision warning. For the SE and Titanium, Ford additionally offers the Luxury Driver Assist package, which includes automatic high beam control, a 110-volt power outlet, blind-spot monitoring, rear cross-traffic alerts and a lane departure warning and lane-keeping assist system. A sunroof is optional for both the SE and Titanium, and the Titanium can be had with 19-inch wheels and ventilated front seats. The Fusion S and SE come standard with a 2.5-liter four-cylinder engine that’s rated at 175 horsepower and 175 pound-feet of torque. Power is sent to the front wheels through a six-speed automatic transmission. For the SE, there are two additional engine options. There’s a turbocharged 1.5-liter four-cylinder, which comes matched to a six-speed automatic. Power output is 181 hp and 185 lb-ft of torque. Those looking for maximum performance should consider the turbocharged 2.0-liter four-cylinder with 240 hp and 270 lb-ft of torque. It also comes only with the six-speed automatic (with paddle shifters). 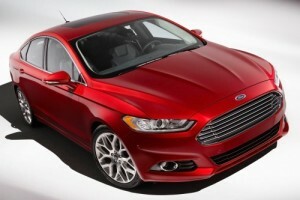 The Fusion Titanium comes standard with the turbocharged 2.0-liter engine. All-wheel drive is optional on any 2016 Ford Fusion with the 2.0-liter engine. The EPA’s fuel economy ratings for the Ford Fusion are pretty solid across the board. For the base 2.5-liter engine, EPA-estimated fuel economy stands at a combined 26 mpg (22 city/34 highway), which is average for this class. The 1.5-liter turbocharged four-cylinder engine can be had with optional automatic engine stop-start functionality to optimize fuel economy. The 1.5-liter with stop-start delivers a combined 29 mpg (25/37); without the stop-start feature, it is rated at 28 mpg combined (23/36). With the turbocharged 2.0-liter engine, front-wheel-drive Fusions earn 26 mpg combined (22/33). The AWD version rates 25 combined (22/31). The 2016 Ford Fusion comes standard with antilock disc brakes, traction and stability control, front-seat side airbags, front knee airbags and side curtain airbags. The Ford Sync system includes an emergency crash-notification feature that automatically dials 911 when paired with a compatible cell phone. Also standard is Ford’s MyKey, which can be used to set certain parameters for secondary drivers such as teens or valets. Optional equipment includes blind-spot monitoring, rear cross-traffic alerts, driver drowsiness detection, a combined lane-departure warning and lane-keeping assist system, a frontal collision warning system with brake priming, and inflatable rear seatbelts. The government gave the Fusion five out of five stars for overall crash protection, with five stars for total frontal protection and four stars for total side-impact protection. The Insurance Institute for Highway Safety gave the Fusion the highest possible rating of “Good” in its moderate-overlap frontal-offset, side-impact and roof strength crash tests. In the small-overlap frontal-offset test, the Fusion earned a second-best rating of “Acceptable.” Its head restraints and seatbelts earned a “Good” rating for their whiplash protection in rear impacts. Cabin design and execution of the 2016 Ford Fusion echoes that of its exterior. There’s a cool and urbane style to the seats and dash, a tone set largely by the high-quality finishes and, of course, the lack of center-stack buttons afforded by the optional MyFord Touch touchscreen system. The emphasis is on having large, nicely textured surfaces and removing extraneous clutter, and it mostly works. The driver seat is easy to adjust into a just-right position and provides good sight lines out the front and sides of the car. It’s harder to see through the sloping rear window, so it’s helpful that a rearview camera comes standard. The roof’s rearward slope also cuts into rear seat headroom, though not so much as to make most average-height rear passengers uncomfortable. The front seats also are mounted high enough off the floor that those in the rear can at least partially fit their feet under the front seats. Trunk space, at 16 cubic feet, is about average for the midsize sedan segment. Any review of a contemporary Ford must also address the optional MyFord Touch infotainment interface. Without it, the base radio and climate controls are still somewhat complicated to use and less aesthetically pleasing. You get a much sleeker look with MFT, thanks to its 8-inch touchscreen. Backed by many redundant voice commands, it can be a powerful tool for configuring and controlling the car and your smartphone. But depending on your comfort level with technology, it might take you a while to get accustomed to using MyFord Touch even for basic functions. And although the system works significantly better than when it debuted, it can still be sluggish at processing touch inputs. There’s a comfortable and assuring tautness to the way every Fusion rides, and the steering is accurate and nimble-feeling. It all comes together to make the driver immediately feel comfortable with its responses. Highway cruising is commendably quiet and composed, and the well-engineered seats make the 2016 Ford Fusion a good companion for all-day interstate hauls. Although it’s fully competitive with similarly sized engines from Chevrolet and Honda, for instance, the Fusion’s base 2.5-liter engine isn’t very inspiring. Perhaps it’s because the optional turbocharged engines are markedly more entertaining. In spite of its small size, the 1.5-liter turbocharged four is smooth and eager and provides an appealing blend of fuel efficiency and performance, even if its absolute performance isn’t exactly eye-opening. On the other hand, the turbocharged 2.0-liter four noticeably ups the performance aspect and pairs well with the Fusion’s optional all-wheel-drive system.